If you're a collector who prefers to leave his reels in "as found" condition, don't bother reading the rest of this section. On the other hand, if you're interested in removing the grease that has hardened for decades or in seeing the metal under the verdigris, perhaps you can find a few tips here. My favorite method of cleaning an old reel begins with its complete disassembly. But I can not overstress the importance of using tools that do not mar the reel itself, especially when it comes to screwdrivers. Always be sure that the screwdriver blade fits the screw slot as closely as possible. Use a hollow-ground blade, if necessary. Ill-fitting screwdriver blades, unpadded pliers, and powered polishing/buffing wheels have virtually destroyed countless numbers of antique reels. If a screw won't turn, apply penetrating oil according to directions and try again. Don't break screwheads off; if you can't disassemble without endangering the screws or pillars, don't disassemble. Keep track of where each part fits; screws and other parts of old reels often are not interchangeable. Once the reel is disassembled as far as possible, I prefer to clean the parts in a sonic bath. To remove verdigris, the green deposit often found on salt-water reels, especially on spools, sonicate (or soak) in vinegar until the powder is soft enough to rub off with a cloth. Usually,the verdigris forms within chips in the nickel plating over brass parts. If the reel contains thick deposits of old grease, hardened or not, a short sonication (or soaking) in mineral spirits should remove most of it. The final cleaning consists of sonication in a non-ammoniated watch-cleaning solution followed by a rinse with a non-ammoniated rinsing solution. If you wish to polish the reel, polish the parts before they are reassembled. Use a fine polish and do it by hand, not with a buffing wheel. Most collectors immediately distrust a gleaming old reel, as they wonder what other "improvements" might have been made to it. Check stampings in the metal for sharp edges; rounded edges on a shiny reel suggest that signs of wear may have been masked. These are photographs of the same small, German silver/hard rubber Holzmann reel shown before (left) and after cleaning, using the process described below. 1. Disassemble reel completely and soak parts in mineral spirits for 30 min. to remove grease. 2. Soak or sonicate parts (as needed) in vinegar to remove verdigris, usually found mostly on the foot and spool. Others have recommended diluting vinegar, which consists of 5% acetic acid. I have never encountered problems using it at full strength. 3. Rinse with water, then soak or sonicate parts for 30 min. in non-ammoniated watch-cleaning solution, followed by soaking or sonicating briefly in the appropriate non-ammoniated rinse. 4. Rinse with water and dry parts. 5. Using a fine polish, such as Wenol, lightly polish the metal parts by hand. 6. Apply a few drops of silicone reel oil to the hard rubber parts, spread by hand, and allow to soak into the rubber for an hour or two. The oil tends to darken the rubber. Polishing the hard rubber may obliterate any light stampings or will make deeper stampings less "crisp." Wipe off the excess oil with a soft cloth. 7. Apply silicone grease or oil to the moving parts as needed and reassemble the reel. Some collectors advise against cleaning older reels, especially if the "patina" might be removed. I've always felt that most of the "patina" on tools like fishing reels usually consists mostly of dirt and grease, rather than an oxidation product of the metal. Therefore, I prefer cleaning the reels and letting a new patina "grow" from scratch. 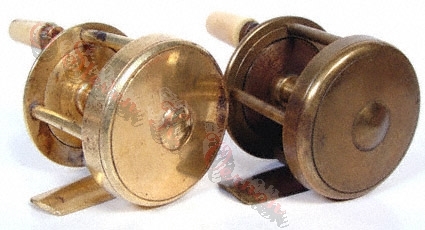 The two reels shown below are very similar British single-action click reels probably well over 150 years old. The reel on the left is shown just after it was cleaned, but not polished, by the method described above. The reel on the right looked just as bright and shiny after it was cleaned several years ago. However, it has developed a nice, even, "natural" patina by sitting on a display shelf since then. A deep patina is not necessarily indicative of great age. Ultrasonic cleaning uses sound waves to agitate cleaning fluids, producing microscopic cavitation bubbles that expand and contract. They implode, blasting fluid against the object being cleaned and dislodging surface contaminants. The cleaning process is faster and more thorough than merely soaking in the fluids, and the agitation reaches crevices that soaking or washing by hand usually misses. In general, cleaning fluids used to clean reel parts by hand may be used safely in sonic baths. Examples include water, soapy water, vinegar, etc. Since reel parts may be coated with any number of greases or oils, which may have hardened or become very dirty over time, it may be necessary to use organic solvents to remove such contaminants. I have found mineral spirits to be effective in most cases, but there are many metal-cleaning fluids formulated for ultrasonic cleaning on the market. I use an ammonia-free watch-cleaning solution, followed by an ultrasonic rinsing solution. The collector should consider that ultrasonic cleaning builds up heat in the fluid, so solvents that might flare up, e.g., gasoline, should not be used this way. Of course, it is important to avoid using solutions that might damage parts, especially plastic parts. Contrary to some opinions I’ve heard, sonication will not remove plating that has not already been damaged by other means, such as corrosion. Unfortunately, ultrasonic cleaners large enough and powerful enough to clean all but the smallest reels are not inexpensive. The relatively inexpensive baths made primarily for jewelry cleaning are often too small for such parts as reel sideplates, and they often do not provide enough power to remove heavily caked grease. Most are designed for use with only water-based solutions. Larger baths providing 100 watts or more of power may be necessary, depending on the kinds and numbers of reels that a collector expects to clean.